See our irrigation photo & video gallery here. Not all irrigation systems are created equal. One of the toughest things to do with any service is to compare apples to apples. Unfortunately sprinklers systems and their installers are no exception. That’s why here at Hometown Lawn, Olathe KS, we are constantly informing our new and existing clients of industry developments, product evolution, installation techniques and water efficiency advancements. The more you know, the better we look in comparison. The local company you seek should have irrigation education / experience, insurance, staff and referrals (if requested). Education and Experience – The design of every Kansas City irrigation system installed by Hometown Lawn is performed and reviewed by our owner, a licensed professional engineer with a Bachelor’s Degree in Civil Engineering specializing in hydraulic design. This education goes unmatched in the KC Metro right from the beginning. For experience, we have installed hundred’s of irrigation systems in Olathe, Overland Park, Gardner, Lenexa, Shawnee, Leawood and more all varying in difficulty from, a simple front yard single zone, to systems that pump from a lake and have an elevation difference across the property of almost 100 feet. Insurance – Hometown Lawn of Olathe, KS carries General Liability & Workman’s Compensation Insurance. Proof of insurance is available upon request. Dealing with a company that does not maintain current insurance could mean a claim against your homeowner’s policy if there were an event. Staff – Hometown Lawn staffs each project accordingly. This could vary from a minimum of two, to a staff of 8 or more. At no time will there be a Hometown Lawn employee working alone to install a new sprinkler system. Adequate staffing insures a reasonable completion time. Referrals – Hometown Lawn is happy to provide referrals upon request. Referrals provided will be from clients of similar projects to your proposal. We also suggest viewing our Testimonials Page of which we are quite proud of. Another resource we suggest is our Facebook page for real client interaction. Rule of three – Call three companies for a bid. Meet with them, discuss your needs and interview them. Follow your instincts & judgement. Not everyone is a mesh. Lap of Luxury – You are considering the purchase of a luxury item and it should be treated as such. Similar to a luxury automobile, sprinklers systems have product quality and options available at varying prices. Consequently, there is a relationship between purchase price and quality. Not everyone needs a Porsche, but you may want more than a Yugo. While a high price doesn’t mean it’s better, you should know that some companies increase profit by putting in a lower quality product, fewer than needed heads as well as fewer zones. On zones & heads, more is not always better, but there is a minimum for optimum performance. All Together Now – Of the three bids you received, you’ll now have a high, low and middle. Be weary of someone that is drastically different from the other bids you received, low or high. Did they miss something, or misinterpret something? Ask questions, be satisfied with the answer. All irrigation systems require water and power sources to operate. Irrigation systems take that water and electricity along a main supply line that distributes water to each zone. The electrical signal opens a valve to the called zone and watering begins. An irrigation system is comprised of multiple zones. A zone is an independently timed section. There are several considerations to determine a zone’s breakout, such as: turf type, landscape, terrain, sun / shade, size, pipe capacity and a few more. One thing about a zone, it should always contain the same type of head. Head type (rotor, pop-up) mix and match is a no-no. The system itself is then broken into several components. Controller – The controller is the brains of the irrigation system. I have also heard it referred to as the clock or timer. The task of the controller is to communicate with the system when to operate. There are many types of controllers available and each one has it’s application. 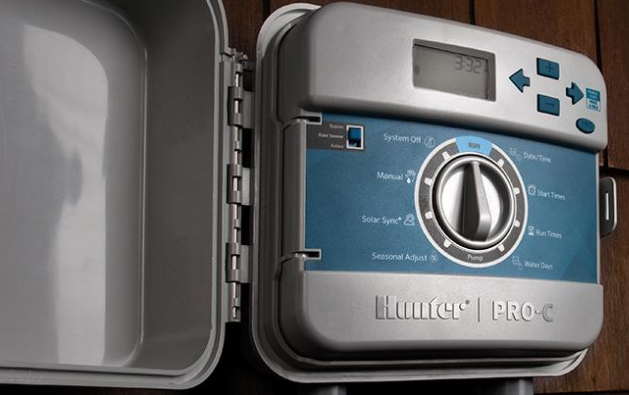 For most homes, we install a Hunter Pro-C. This controller is also able to control landscape lighting. But that’s another page. WiFi enabled controllers are also available. Please ask for details if you are interested. From the controller, the system is programmed to water. Each zone is independently timed. Programs may be set for all, multiple or one zone. Each program can have multiple start times on the days it is set to run. Rain and weather sensors also communicate through the controller. The optional Solar-Sync is an advanced weather sensor that modifies the seasonal adjustment to accommodate recent weather conditions. It is not possible for a human to perform the tasks of Solar-Sync. It’s constant adjustments would create an expectation of a return-on-investment of less than three seasons. Pressure Control – Too much pressure is a bad thing. Not enough pressure is a bad thing. We need to be somewhere in the middle. Pressure regulation allows us to dial-in a lower pressure if we are seeing readings in excess of 95 PSI. These greater pressures wreak havoc on the piping and distribution network of the irrigation system. It can shorten the life of valves, break connections, cause undue wear to all nozzles, create water-hammer, vaporize the sprays and much more. We always recommend to opt for pressure regulation when over 95 PSI. Backflow – A backflow is a device that is required by law and installed nearest the water source in-line to ensure single direction flows and prevent cross connection. Most common types are Double Check, Reduced Pressure Zone (RPZ), and Pressure Vacuum Breaker (PVB). Backflow assemblies must be tested and inspected by a Certified Professional on intervals set by your municipality. The type installed is also determined by your municipality. WaterOne, which serves Overland Park, Lenexa, Leawood, Shawnee and other cities, allows any of the three, but City of Olathe service & the City of Shawnee does not allow a DoubleCheck. They are permitted under grandfather clauses, but must be tested annually and may not be repaired. They must be replaced with a conforming device upon test failure. Valves – Valves are devices within the irrigation system that start or stop the flow of water. There is one valve for every zone. Heads & Nozzles – There is quite the variety of heads and nozzles on the market. We often select from PGP Rotors, MP-Rotator and Pro Adjustable Nozzles. Pipe – We use all copper and polyethylene pipe for our residential systems. Commercial applications could see a PVC mainline due to sizing needs. We do not use a PVC main in residential because we feel the lifespan is shortened in comparison to poly. We have repaired many PVC pipe breaks simply because the PVC pipe itself becomes brittle over time. We don’t see that with the poly pipe. Starting at the source of your system, you are getting top quality parts, design and master craftsmanship. Our taps, unless not possible, are made in the yard against the meter. This mean no water inside your home to fail and flood. (We’ve seen it by others) Here’s a quick video describing our tapping process. Installation is done by a method called “pipe pulling”. It is the least invasive method to install irrigation and sprinkler systems. An access hole is dug at the start and stopping points. Then the machine is connected to the pipe and/or wire to begin the pull. As can be seen in the video, only a blade cut is made across the surface. This cut is promptly laid back down and driven over to minimize damage to the lawn. Proper moisture in the ground prior to installation can have a positive effect toward restoration. We expect to have an average home completed within 2-4 days. Many obstacles could extend this period, however it is a good estimate. Excessive rock or hand digging can extend the completion period. As in all home-ownership, irrigation systems too require maintenance to keep performance at optimum. Ideally, you would only require a professional to visit in the Spring and Fall. We also would suggest a mid-season review. You may be watering the street or shooting up a fountain and not even realize it. We perform a 19 point check at every start-up. This aides to detect any issues coming out of Winter or potential problems with the upcoming season. Sprinkler winterization, or blow-out, is done by connecting a commercial grade air compressor to your underground irrigation system. The purpose is to replace the water in the pipes and heads with air so when freezing temperatures arrive there will not be enough water to freeze, expand and cause damage. THERE IS NO SUCH THING AS A WORKING SELF-DRAINING IRRIGATION SYSTEM IN CLAY SOILS, aka KANSAS. DON’T FALL FOR IT. They catastrophically fail after a period of time and result in large repair bills. All Hometown Lawn new irrigation installation systems in the Kansas City metro area come with a Two-Year Parts and Labor Warranty. To maintain the warranty for the entire two years, only Hometown Lawn can service the system. We also require that we turn the system on in the Spring and winterize it in the Fall. It is at these times we try to take advantage of time to review the system’s performance and work proactively should an issue reveal itself. The start-up and shut-down services are discounted for the two year period on the systems we install. See our complete Terms of Service for all details. Now it’s time to sit back with your favorite beverage on your patio and enjoy the view. It just isn’t possible to have a healthy lawn in Kansas City without an irrigation system. Our precipitation, heat and clay soils just don’t play nice with the grass. If you think you are ready for a system, please give us a call to set-up your free estimate. We would love to see if we can provide you with the lawn you only dreamed you could have. All of our new irrigation systems come with the following highlights. 2-Year Parts and Labor Warranty – Some restrictions apply, see our TOS for more details. Master Valve – This means your system mainline is not constantly supplied with water, water is live only when the clock is telling the system to irrigate. 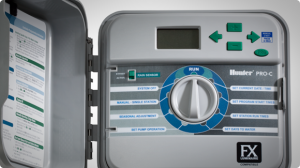 This device minimizes the opportunity for leaks to run water continuously if there is a break and costing money. Rain Sensor – A Hunter Rain-Clik rain sensor is included. This base model is upgraded with the Hunter Solar Sync when our Efficiency Package Upgrade is purchased. All connections are double-clamped minimizing the opportunity for a leak. Sch40 PVC is used for all PVC within the system. A thicker wall pipe lessens the opportunity for breaking. All copper and brass to the supply valve.